I wanted to share with you what my daughter's made me for my b-day. I've always told them that the best gifts are the ones that they create. 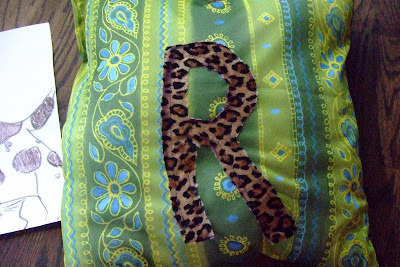 Well....my oldest made me this cute pillow with my initial sewn on it. I will treasure it forever! 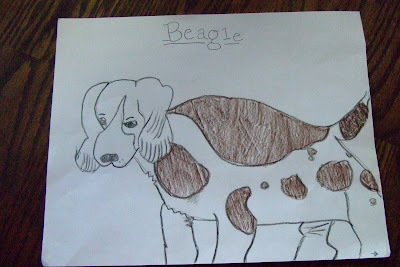 My youngest drew my this picture of a Beagle and I thought it was very cute. The other night I rescued a Beagle and took it back to it's owner so she thought I'd want a picture of that memory. She's taking art next year in 6th grade so she's made a great start. I'll be framing this one and putting the date on it. I feel very blessed that they are so creative. It's fun to be able to share in this love of art. Great to have companions to do the things we are most passionate about. Counting my blessings today as a mother!